Want to use your Plum bindings with a boot quiver? Add some adjustability with these plates from Plum. All plates are sold in PAIRS. 40mm Heel Plates - The rails offer 40 millimeters of fore/aft adjustment for the Plum Race 135/145/150 bindings. The kits use the same Torx T-25 bolts found on the Plum 165/170s. The 6.5mm thick plates weigh 34g (1.2 oz) plus another 10g for the nuts and bolts. Includes said nuts & bolts that Plum was thoughtful enough to assemble on the rails for easy installation. In addition, the kit comes with a mini star-key that you can add to your touring toolkit. Wide Rails - Replaces the stock Race 165/170 adjustment plates with a wider mounting platform for wider skis. The mounting holes match Guide or Wepa heels (same as many Dynafits), which provides a means of lightening up a Guide binding without redrilling (put Race 170 heels on top of these rails). 19g per plate, 20mm of adjustment range. Rental Toe Plates - Fits any 4-hole Plum toe. Built to give some more adjustment to your Plum binding or change your boot center on the ski. 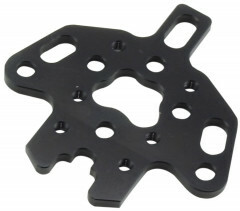 It also reduces your pin-height delta (ramp angle) since the plates are 9.5mm thick. 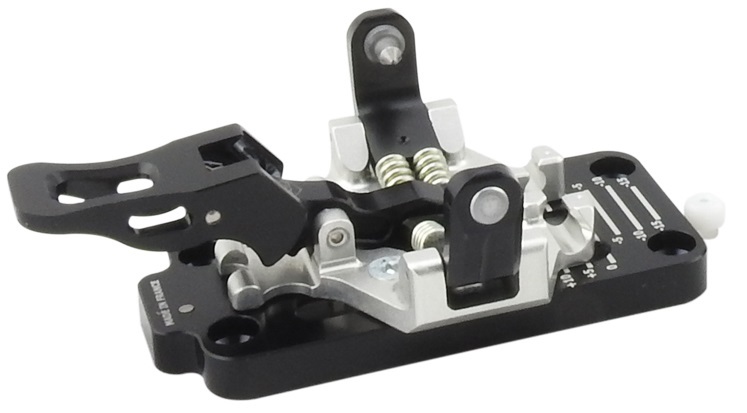 Easy-to-operate adjustment lever locks securely without tools. 30mm of adjustment, 87g per plate with hardware, and comes with T25 bolts to fix Guide, Yak, Race, or WEPA toes to the plates. Toes and mounting screws NOT included. Use the mounting screws that came with your Guide binding, or get extras here. 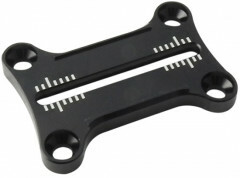 Low-Tech Adapter – Bridges the gap between your splitboard and Plum toe piece. Made of sturdy lightweight aluminum that has been machined to save weight, the baseplates mount right into the standard three-hole Voile pattern on most splitboards. It even has a little tab to support the crampon attachment. Sold in pairs and weighs 43g per side. Hi would these fit into the bolt holes already drilled for a plum 150 binding? Basically I want to know if I could put these onto the heel and toe holes already drilled in an existing binding that is for a BSL 327 to reduce the length to 294. Maybe there's a better way of doing this? Hi Jesse, these are long plates so you'll have plenty of options for working around the existing holes to fit the shorter boots. What hardware do I need to buy to mount the rental toe piece? Hey Jon, thanks for reaching out and bringing the lack of included hardware to our attention. Because of it, we are now including machine screws with the Rental Toe Plates so you can affix your toes! It won't include any mounting screws to attach the plate to the ski (as you should already have those), but it uses Guide Mounting Screws so if you are looking for new screws they can be found there. Does the heel adjustment plate work for the Plum 150 bindings? Thank you! Hi Patrick, thanks for pointing out our description failed to mentioned the 150s. Yes the 40mm heel adjustment plate will work for this!  The Wide Rail, however, will not work with the 150. I hear that the 165-185 are optimized for this slider, so does that mean that a 135/145 heelpiece would have too much stack height if mounted with these plates? Hi Carl, these are designed to be used with the 135/145/150 (the 185 comes with these, the 165 has a 2 bolt plate). They add about 6.5mm to the heel, which is still low compared to most touring tech bindings. Some folks think this is a perfect amount of lift. The ramp in your boots also plays a role. In other words, no, it's probably not too much height for most situations. Would these fit the dynafit radical toe piece? If so, or regardless, how thick are they? Hi Steve, unfortunately these plates don't work with Dynafit toes. 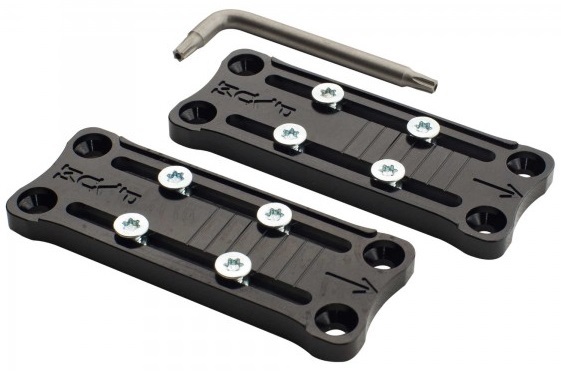 Your best bet for Radical toe adjustment are the Aski front plates. Thanks for pointing out the thickness was missing from the description of the Plum heel plates. I've updated it to show they are 6.5mm.